St Aidans Nursery Picture Day will be held on Monday the 28th of November 2016. Children who attend the nursery on a Monday will have their photograph taken in the morning. Children who do not attend nursery normally on a Monday will then have the chance to book an appointment for the afternoon to ensure they have a photograph taken too. Parents/Carers will then have the opportunity to purchase the photographs taken. On Thursday 21st of July, a lady from the foods standards agency visited Ann & Jackie, the nursery cooks, to inspect our kitchen. We are pleased to say that we achieved a fantastic 5 star rating! This year at St Aidan's Day Nursery parents evening will be held on Thursday the 14th of July 2016. Come and celebrate your children's achievements with us! Please see your child's key person for more details. After having many wonderful entries for our Father's Day competition, we announced the winner on Friday; who is.... Leo! Take a look at Leo and his Dad's Photo below! If you recommend a friend to St Aidan's Day nursery, you could benefit from a free day of childcare! Subjects to terms and conditions. Our Fantastic Father's Day Hamper! Be in with a chance of winning of fantastic Father's Day hamper by entering our Father's Day competition! All entries need to be in by the 16th of June 2016. Look at our new construction area! Pre-School have built a fantastic new construction area in their garden! The children are all excited to start building! Book now to secure your child's place for September! Stretched Funding will also be available; more information to follow. 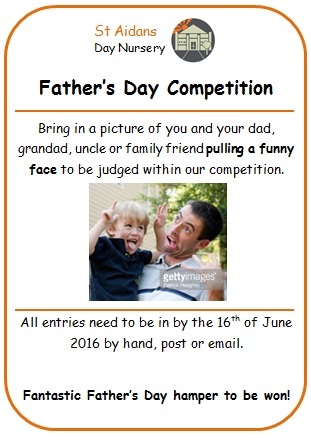 In order to celebrate Father's Day this year (19th June 2016), we are having a Father's Day Competition! Please find the details below - Fantastic Father's Day Hamper to be won! Last Friday we finally decided that it was time to let our butterflies free! Pre-school decided that we would set them free in the woodland at the end of their garden. On Friday 6th of May, all toddler children have been invited to a Teddy Bear's Picnic! Say Hello to Butterfly Number One! After a lovely weekend, our first butterfly has hatched this morning! Hopefully within the next few days all chrysalis will have hatched and we will have 10 beautiful butterflies! On Thursday the 21st of April, St Aidans Day Nursery will be celebrating the Queens 90th Birthday! The children are invited to dress up in their best party clothes or wear red, white or blue in the Queen's honour! We look forward to seeing you there! Our caterpillars have moved into their hatching habitat! Our caterpillars have become fully formed chrysalis and have been moved into their hatching habitat. We now have to watch and wait a further 7-14 days until the chrysalis are ready to transform into beautiful butterflies! We have some exciting visitors in nursery! Watch them grow from an egg to a caterpillar, to a chrysalis, then a beautiful butterfly! This is supporting the children's knowledge of 'understanding the world' allowing them to experience the full life cycle of a butterfly. On Monday the 4th of May 2016, Toddler Room will be holding another story session event. Please speak to a member of the toddler room for further details. The story this time will be 'The Very Hungry Caterpillar! '.